It doesn't look like much. 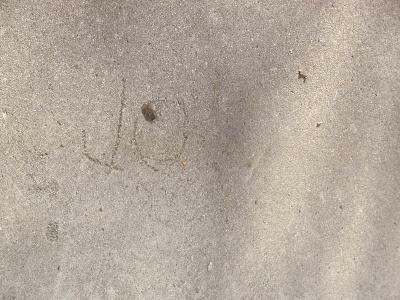 A name scratched into concrete before it dried. But sometimes looks aren't everything. It's 40 years old, most likely, although the picture was taken less than a year ago. It's much more than a name. In fact, it used to be several names, but only one remains. Sometimes the physical is nothing more than a portal to the memories, and a familiar sight can bring back the blazing heat of the sun, the memory of standing out behind the garage eating watermelon, and spitting the seeds into the alley. The picture doesn't show you the Ohio summer sun beating down on the frustrated worker, or the passle of kids crowded around clamoring "Whatcha doing Daddy? Are you done yet? Can I touch it?" The picture doesn't show you anything except a patch of concrete with a name scratched into it. Sometimes it takes words to make a picture come alive. I was 4 or 5 years old, and my dad decided it was time to get rid of the gravelled area behind our garage. The basketball hoop was out there, attached to the garage roof where it peaked, and the sandbox was back there, as well. Common sense declared that gravel was not the best type of surface for the kids' playground, and he wanted us to stay off the grass long enough for it to have a chance to grow. When the pad had been poured, he smoothed it out, using the tools and experience he had gathered over the years. Then one by one, we stood beside him, and he dusted off the soles of our shoes on his pants-leg, and we got to set our footprint in the concrete, and then write our name. Just like the stars did at Grauman's Chinese Theater, except we didn't use handprints, just footprints (Mom might have had something to do with that particular decision). I went back to the old neighborhood last winter, when I was home for Mom's funeral. It had been 20 years or so since I'd been around there. We drove down by the old swimming pool, and it had moved. It was still there in the same vicinity, just in a totally different location, which really messed with my kinetic memory. If I had been walking instead of driving, I know I'd have walked right up to where the pool had originally been. There were condos there now. We drove by my old elementary school, and the asphalt playground where we played softball and stood outside for Memorial Day Assembly was covered with grass. It startled me to see, but at the same time, it was pleasant, and I'm sure it was much more comfortable for playing on than the asphalt had been. We drove by the house I grew up in, that we moved out of 30 years ago next spring. The folks bought it in 1962, for the grand sum of $12,000, and sold it in 1975 for $25,000. I looked it up in the tax rolls when I got home that day - it's now worth over $100 grand, and has been owned by the same family for 20 years or so. I hope they've enjoyed it as much as we did. I'll be writing more about that house, I'm sure. I did notice that it looked smaller than I remembered, and was surprised when I looked online and found that it was only about 1800 square feet. It must have been expandable, to hold the energy and dreams of so many families through the years. My cousin drove up the alley, behind the house, and we stopped and looked at the concrete pad my dad had poured so many years ago. My sisters' name was all that remained. That, and a million memories. It doesn't look like much, but sometimes looks aren't everything.